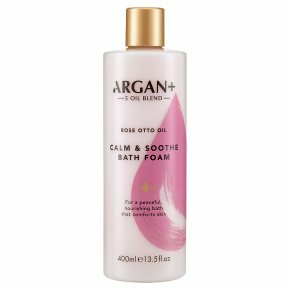 This calming bath soak combining precious Moroccan Argan oil with Avocado and delicately fragrant Rose Otto oil is perfect for indulging in a peaceful, nourishing bath. The luxurious aroma will bring a sense of relaxation and serenity for total well-being leaving skin softer and gently cleansed to perfection. Precious Moroccan argan oil with soothing rose otto oil. Skin feels soft and pampered.Enrich your skin and senses with this soothing Moroccan Rose Bathing Collection infused with a unique Argan + Synergy, rich in nutrients and vitamins. This calming bath soak combining precious Moroccan Argan oil with Avocado and delicately fragrantRose Otto oil is perfect for indulging in a peaceful, nourishing bath. The luxurious aroma will bring a sense of relaxation and serenity for total well-being leaving skin softer and gently cleansed to perfection. Argan + Synergy is an all natural 100% blend of precious Moroccan Argan Oil with 4 other amazing oils: Baobab, Kukui, Moringa and Sacha Inci, all selected for their restorative, regenerating and nourishing properties. Directions for use: Pour under running water and swirl around the bath. Step in, inhale slowly and enjoy. For external use only. Should irritation occur, rinse well and discontinue use. Avoid direct contact with eyes. If product gets into the eyes rinse well with water immediately.